The legendary Zina Rachevsky was the earliest Western student and patron of Lama Yeshe and Lama Zopa Rinpoche. Everything about her including her royal heritage had become legendary. Her family was incredibly wealthy to begin with. Her grandfather established SW Straus & Co. that held loans on a string of buildings across the United States that was worth $150 million dollars in those days. In 1930, her grandfather passed away and it was also the year that Zina was born. She was a precocious, intelligent and an independent child. She grew up to be a Hollywood actress and gained her reputation as an international socialite. She married Count Bernard d’Harcourt when she was only 18 and then divorced him two years later. At one point, she would be seen with the likes of screen legend Marlon Brando. She would later give birth to a son, Alex by Conrad Rooks, a troubled filmmaker and a daughter, Rhea Rechevsky. Her apparent royal background was really not what it seems and it was a part of her family lineage that she embraced in order to avoid anti-Semitic backlash considering the other Jewish part of her family line. Her father was the brother-in-law to the Grand Duke Boris, the last of the Russian Romanovs. Her father and his wife, Harriet got married in 1929, about 12 years after the Russian Revolution. It was her family ties with the Grand Duke that Zina assumed her identity as the wild Russian Princess and it became a part of her larger-than-life persona that many still remember her by. Zina had everything – money, fame, beauty and a string of marriages and relationships but she was deeply unhappy and that triggered her soul-searching. 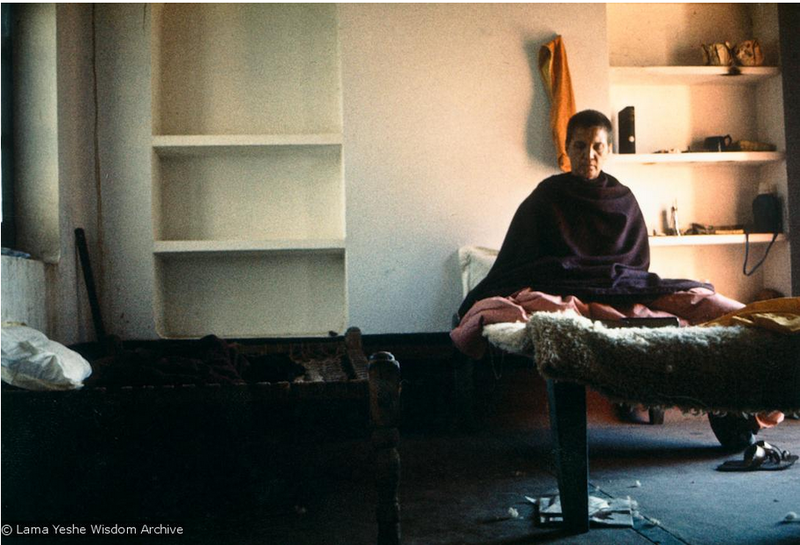 In 1965, Zina came to India and it was in India that she encountered Lama Yeshe and Lama Zopa. Before meeting the lamas, she had read about Domo Geshe Rinpoche in Alexander David Neel’s book. To her delight, her guide brought her right to Lama Zopa, who was also known as Domo Rinpoche simply because he was a tulku of Dungkar Gompa. Domo is the name of the area around Dungkar monastery and tulkus of the monastery is traditionally named after the area. Lama Zopa and Lama Yeshe at that time never had any encounters with Westerners and Lama Yeshe was pleasantly surprise to learn that Zina came to them in search of enlightenment. At that time, the Tibetans regarded Westerners as mere spiritual barbarians, unable to perceive the value of the Dharma. Zina with her characteristic intensity shattered that view. Thus began her involvement with Lama Yeshe and Lama Zopa with a long line of endless questions. Her thirst for the Dharma was unquenchable and her faith in Lama Yeshe and Lama Zopa was equally unwavering all through the years. In the earlier days, she would also request Lama Yeshe to teach a meditation course but he would refuse, probably due to his limited English vocabulary in those days. So, she turned to Lama Zopa to teach and after pestering him, he finally agreed with Lama Yeshe’s approval of course. At the same time, she brought many Western students to study with them. She returned to America to share what she had learnt and celebrated thanksgiving at Mary Jane “Max” Matthews’ home. Max Matthews or Mummy Max as she became affectionately known would eventually become a key sponsor of the monks and Kopan Monastery. She later became ordained as a nun as well. In the beginning, it was obvious that Zina was in control. She was extremely thirsty for the Dharma but didn’t know anything about Buddhist traditions and rituals. On one occasion, Max purchased an antique statue and excitedly showed it to the Lamas. Lama Yeshe said that the statue looked pretty good but he wanted to examine the holy items encased within the statue. So, Lama Zopa and Lama Yeshe performed a puja in Max’s bedroom, which was in the basement of the house. The puja was to ritually open the statue and after examining the items within and then another puja was performed to consecrate the statue again. However, everyone else just went upstairs and started to party away and forgot about the chanting lamas in the basement. Later, they felt an energy emanating from the basement and the soft sounds of the bell and the tapping sound of the damaru wafted through. They went downstairs only to realize that the energy came from the statue. Apparently, the statue was very old and that it contained holy relics of the previous Buddha. Everyone sat in a semi-circle to bask in the holy energy that permeated the room. A deep conversation soon ensued about what everybody wanted to do with their lives. Zina confessed that she had created a lot of bad karma in this life and that she wanted to ‘make up’ by creating a place where people could come, work and study the Dharma with the lamas. That was how the idea for Kopan monastery was born. Zina would promote her Lamas with whomever she met and even brought a French film crew to Tibet in order to film Lawudo cave in Khumbu. Lawudo was where Lama Yeshe was born and the cave was the place where Lama Zopa’s previous life meditated in. Over time, she bought land and founded Nepal Mahayana Gompa Retreat center that eventually became Kopan Monastery in Nepal. Even as she was devoted to her Lama, she found herself constantly arguing with Max. Although far removed from their familiar environment, one thing remained the same – they were both used to being the center of attention.Some American students were shocked by the manner in which Zina and Max fought for ‘control’ over the lamas that these students would repeatedly reassure the lamas that not all Americans behave in this manner. In those days, Zina would be over-protective of Lama Yeshe and she would not let anybody meet Lama Yeshe and she would tell visitors that Lama is busy. It seems that she wanted to keep Lama Yeshe all to herself. But then, some of the visitors were shocked by the manner in which Zina had housed the lamas. At Kopan, Zina stayed in a large bedroom decked with a luxurious white carpet and a leopard-skin bedspread while Lama Yeshe and Lama Zopa lived a spartan existence in a tiny little dark room with 2 beds behind the house. However, the Lamas never complained. Generally, people cursed Zina under their breaths because she had little regard for other people’s possessions. However, nobody had the heart to be really angry with Zina because she was still a genuine friend. By and large, she was friends with everybody and yet she was close to nobody. 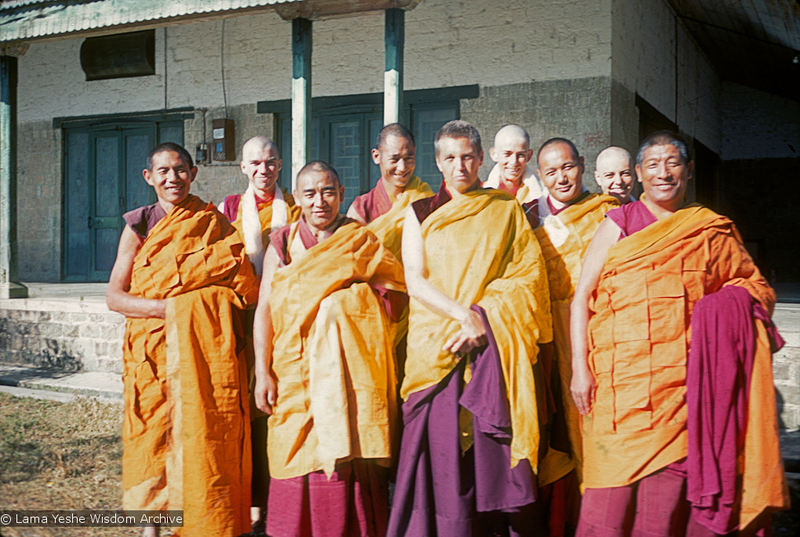 In 1970, Zina travelled with Lama Yeshe, Lama Zopa and some other western students to be ordained in Dharamsala. The ordination took place at Chopra House, Kyabje Ling Rinpoche’s residence just outside McLeod Ganj. Geshe Rabten presided over the ceremony along with Lama Yeshe, Gen Jampa Wangdu, and two other monks. This was done according to tradition with four monks and an abbot as required for monastic ordination ceremonies. A picture of Zina Rachevsky right after ordination. 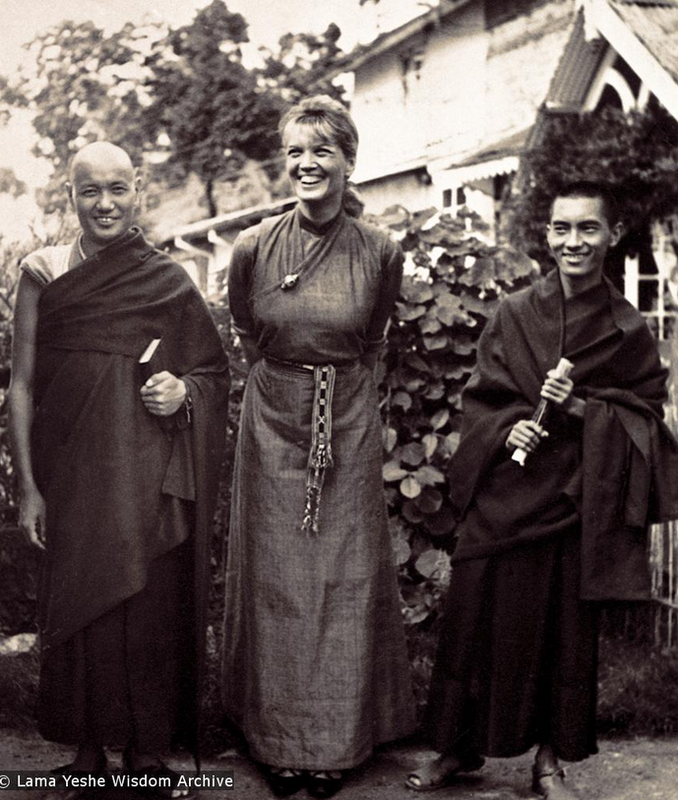 She is in the middle with Geshe Rabten on the right and Lama Yeshe standing right behind him and Zina along with other monks and nuns. Zina Rachevsky was transformed by her spiritual practice and nunhood. Towards her last years of her life, she entered a long solitary retreat and midway through the retreat, Lama Yeshe suddenly decided to meet her. He hastily made his way to see her and he talked to her extensively. That would be the last time they would meet in this life. Not long after, Zina Rachevsky passed away which some say was from food poisoning and some say from hepatitis but post-mortem tests showed that she had died of cholera. In the Buddhist tradition, the manner in which she passed away was auspicious because she spent her final moments in deep spiritual practice. She led her life to the fullest from her Hollywood days to renouncing everything when she met Lama Yeshe and Lama Zopa. She studied extensively, sponsored her Lama, established a whole monastery and brought many students to her Lama. Apparently, she had taken rebirth as a French boy and was recognized by Sakya Trizin Rinpoche to be her reincarnation. Zina’s story serves as a great inspiration for her generosity, perseverance and her genuine thirst for the Dharma. This goes to show that anybody from any part of the world can just take a leap of faith and go all the way with the Lama’s teachings and building projects. 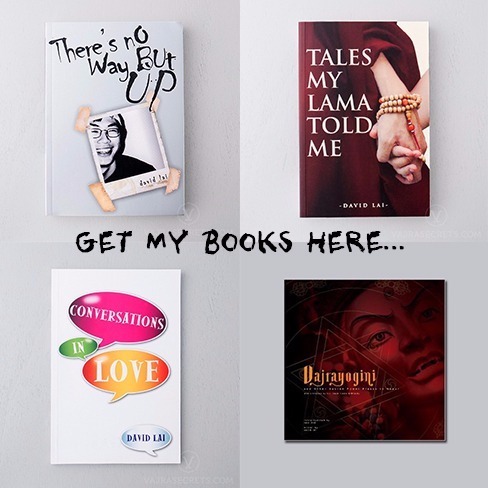 ← Why does Tsem Rinpoche have a ladrang? There was no post mortem. No-one knows for sure what caused Zina’s death….and they never will because she was cremated at Thubten Choling soon after she died. Thank you for your comment. I was just wondering how did you know that? Do you know Zina personally? Where did you see that post mortem testing was done? Tganks! More sources are all listed right under the article for anyone to go through. I knew Zina and also Max Mathews well, and I thought Zina died of TB. Thank you for leaving a comment. Well, what I know of Zina is what I have read and researched online. I have never met Zina but I am glad to read about her inspirational life.